The 19th annual North Carolina Club Teams Championship will be held on several courts in the Linville area. Play will begin the morning of Thursday, July 24, to conclude by mid-afternoon on Sunday, July 27. Play is doubles only, in four or more flights. Entry will be limited to 48 doubles pairs (first come, first served). 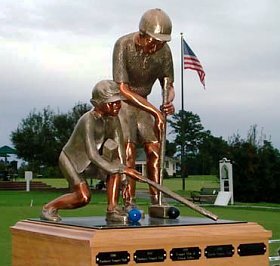 Each entry will represent their NC croquet club in the Penwell Trophy competition. Points are awarded to each entry that finishes 4th place or higher within a flight. The club with the most points is the winner and will have their name inscribed on the trophy. Also, individual trophies will be awarded in each flight. Each entry will be scheduled to play a minimum of six games (up to three games on any one day of the tournament). However, games may be canceled if necessary as a result of weather delays or drop-outs. The tournament fees include lunch and soft drinks each day, a tournament dinner, and a finals brunch.